Happy new year everyone! This is our first post for 2015. It's a bit different but it is design-related. 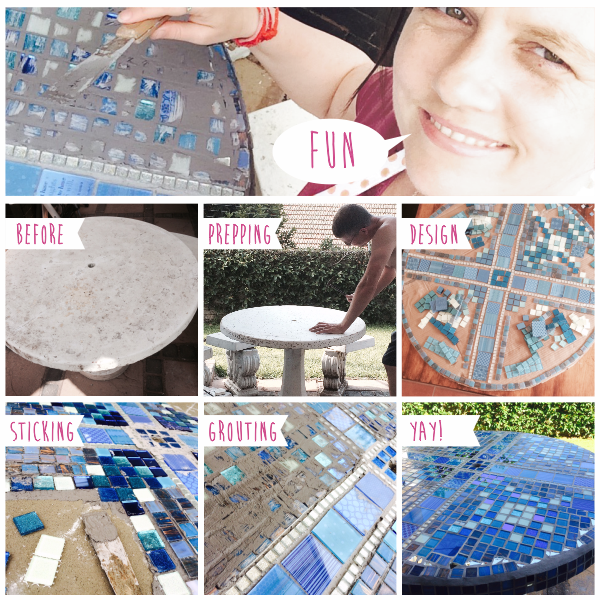 We upgraded an old concrete garden table with mosaic. It was a bit tedious and messy and I got a bit cooked in the sun but it was fun and well worth it! We bought a bunch of mosaic tiles from Ceramicraft in Northdene. Hubby Dean prepped the table surface so that the adhesive would stick nicely. While he was doing that I was creating a mock-up design on a large piece of round cardboard. When the surface was ready I marked up the design in chalk, mixed a bucket of tiling cement and got started. It took about 6 hours to tile the whole 900 x 900 mm surface. We let it 'cure' overnight and the next day did the grouting which killed my fingers as I applied more grout with those than with the applicator. The excess grout was cleaned off and you can see that the final product was great!